Although Czech and Slovak cinema are commonly thought of as different sides of the same coin, what is termed “Slovak cinema” possesses a unique aesthetic completely removed from its more urban Czech brother. 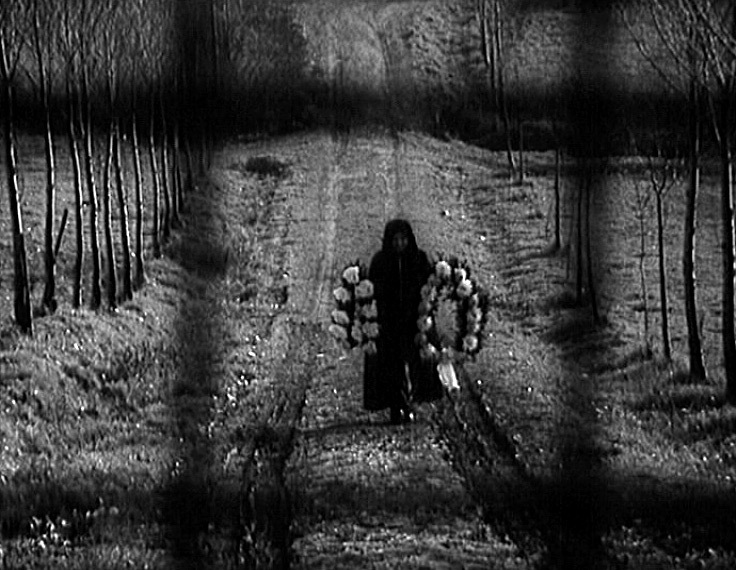 Although what exactly constituted a “Slovak” film was a fairly fluid concept for much of its early history, a significant portion of films by and for Slovaks shared an aesthetic that drew its formative influences from the indigenous folk traditions of Slovakia, as well as from the avant-garde photographic and painting traditions propagated in Prague and Bratislava. This article aims to not only give an overview of the broader historical development, but to problematize the normal conception of Slovak cinema being either “Czechoslovak” or purely “Slovak”. Instead, I would like to call attention to Slovak film’s rather unorthodox development process and its forgotten multiculturalism, as well as underscoring how these factors have shaped the development of this unique national cinema up until its arrested development, following the 1968 Warsaw Pact invasion of Czechoslovakia and 1972’s Normalization, the period of political repression that ended the golden age of Slovak film. While many national cinemas (such as American, British, German, and Russian film) began their formative development shortly after the first public screenings of the Lumière Brothers’ cinematograph in 1895, cinema in Slovakia had a much different genesis and evolution. Although the Slovaks’ closest neighbors (linguistically, culturally, politically, and geographically speaking), the Czechs, had a robust early cinematic culture, Slovaks themselves were conspicuously absent from the development of early cinema in their own sphere, though this is not to say they were unaware of the new medium [note 1]. Rather, although Slovaks themselves were exposed to cinema in a variety of ways— Slovak immigration, traveling cinema shows, scientific demonstrations in the major cities— Slovakia and Slovaks remained mostly spectators and subjects of cinema rather than its producers up until the 1930s [note 2]. Films made by Hungarian, Austrian, and Czech producers often focused on Slovakia’s stunning natural vistas or the vibrant folk-culture that survived in its mountains while Slovaks themselves were, with a few exceptions, relegated to on-screen talent or local color. Some of this early divide between the Slovak spectator and Slovak film, or more precisely the lack of such films, can be attributed to socioeconomic factors. As Slovak film historian Václav Macek notes, up until 1918, Slovak cinema was under the purview of Hungarian authorities, and, as such, often catered to an Austro-Hungarian audience (cf. Mácek & Paštéková 1997: 13, 17, 18). Film journals were written in Hungarian, films were shown in German or Hungarian, and many of the early cinema halls were in the major cities and not in the rural parts of Slovakia where much of the population was located. These urban areas, now associated with Slovakia, such as Bratislava (formerly known as Pressburg/Pozsony) and Košice (Kassa in Hungarian), were often multi-lingual and multicultural areas, where Slovak identity often fluctuated with political sentiment. As Peter Bugge notes, for example, prior to World War I in Bratislava “more than one-third of all marriages were ethnically ‘mixed’, bi- and even trilingualism was common, and associational and social life was only rarely organized along ethnic lines” (Bugge 2004: 216). The inhabitants of Košice were similarly disinterested in identifying as Slovak unless it was politically expedient, given the rapid wholesale shifts in the town’s purported ethnicity for much of the early 20th century— for a Košice native, ethnicity often simply meant identifying with the dominant political power of the day. In this sense, cinema was not an art form that was easily adopted by the self-identifying Slovak population (who mainly lived outside of the major metropolitan areas or abroad), who lacked the resources, training, or infrastructure to produce or even consume cinema in Slovakia proper. Further complicating the situation was resistance to films on the side of both the clergy and Austro-Hungarian cultural authorities. Theatre owners protested the decline of revenues and attendance due to competition from cinema, and various localities in Slovakia would attempt to ban or severely curtail cinemas through legal means (cf. Votruba 2005). Members of the Catholic clergy were also variously against the showing of films for moral reasons, while Hungarian political authorities were more sensitive to films which might have untoward messages than their Austrian counterparts in Bohemia and Moravia (see also Hasan 2016). Up until 1918, films that had any explicit pro-Slovak content were unthinkable in the Kingdom of Hungary, in direct contrast to the thriving Czech film industry right next door, whose cinematic development featured many films based on scenes from the history and legends in the Czech Lands. While early films shot in Slovakia exist, many of these early films were Hungarian, Austrian, and Czech travel films, designed to highlight the craggy beauty of the famed Slovak mountain ranges or local folk customs that still survived in Slovakia. Other early films produced by Hungarian directors focused on areas of Hungarian national pride – a promenade of the wealthy citizens in Košice, the dedications of local monuments, and various newsreels. What Slovakia did have in abundance was a rich history of ethnographic study and research (especially in photography and lithographs of folk costume), as benefiting the “frontier” of both Austro-Hungarian Empire and the nascent Czechoslovak Republic. For foreign ethnographers and Slovak artists alike, Slovakia’s undeveloped hinterlands offered romantic escapes to a distant past as well as valuable sources of ethnographic data. Slovaks themselves enthusiastically embraced their own ethnographic endeavors and Slovak visual culture as a way of propagating Slovak nationalist ideals as well as a means of communication that cut across the boundaries of dialect and literacy [note 3]. Fig. 1: Jánošík (dir. Jaroslav Siakeľ, 1921). The frame story of the 1921 version of Jánošík takes great care to locate the bandit’s myth in the past, while the modern (Czecho)Slovaks are depicted in contemporary 1920s clothing, outside of the old shepherd who retells the myth. The Jánošik myth treads a familiar path: Juraj Jánošik is driven to outlawery due to Hungarian mistreatment and torture of his family, he loots and burns the stately manor homes of Hungarian lords, and re-distributes his ill-gotten gold and goods to the poor. Juraj’s downfall only occurs when he spurns the attentions of a jealous old woman (Jánošik stays devoted to his beloved sweetheart Anička to the end), who betrays him to the authorities. Jánošik is then tried, offered a reprieve if he swears allegiance to Hungary, but, in the end, refuses, preferring to take his own life by defiantly leaping onto the red-hot hook prepared for his public execution. Jánošik’s life, already well-adapted to the stage and folk performance, was well-known among Slovak communities not just in Central Europe, but in America as well, where he served as common thread to tie together Slovak groups that might not have otherwise had much in common. This American connection cannot be understated: the first Jánošík film proper was produced by two Slovak immigrant brothers living in Chicago, Illinois: the Siakeľ brothers Jaroslav and Daniel, who had immigrated to the United States in 1911 and 1905, respectively. During their stay in America, the Brothers Siakeľ had briefly worked with the Selig Polyscope Company and so had some limited experience with the technology and techniques of early cinema, though they were not themselves originally filmmakers. Seeking support from the larger Slovak community in Chicago, they lobbied the local financial elites into creating Tatrafilm, the first Slovak film creation and distribution company; Slovaks in Chicago and elsewhere were hopeful that this would herald an increased amount of Slovak-themed media, though the company disbanded shortly after financing Jánošík, its first and only production. The Siakels, noting the popularity of Jánošík stage productions and the lack of Slovak cinema, resolved to create a feature film about the national hero. But ahead of them lay no small task— despite cinema’s rapid global adoption, Slovakia still lacked the cinematic infrastructure which had already developed in places like the Czech Lands, the Kingdom of Hungary, and America. Camera technicians and professional film developing labs were lacking, and official technical training in Slovakia itself was almost unheard of until the end of the 1930s. Although the Siakels themselves had gained some minor training through their employment with the Selig Polygraph Company in Chicago, they were mostly self-taught in their roles of director and camera operator. Jánošík was shot on location in Slovakia, and although it was originally intended to be a wholly original cinematic adaptation of the bandit’s life, its script was only a third complete before the cast and crew relocated for the shooting. Although the remaining two-thirds of the script were completed, the completed script was delivered after shooting had wrapped. As a result, the Siakels were forced to complete the script by drawing liberally from two of the most popular contemporary sources of the Jánošík myth in popular literature—Gustáv Maršall-Petrovský’s 1894 Slovak language novelization of the Jánošík myth, Jánošík, kapitán horských chlapkov – jeho búrlivý život a desná smrt’ (Jánošík, Captain of the Mountain Lads—His Turbulent Life and Horrible Death), and the 1910 stage play, Jánošík, by Czech playwright Jiří Mahen (fig. 2). Fig. 2: Jánošík (dir. Jaroslav Siakeľ, 1921). Notice here the emphasis on folk dancing and folk costume. 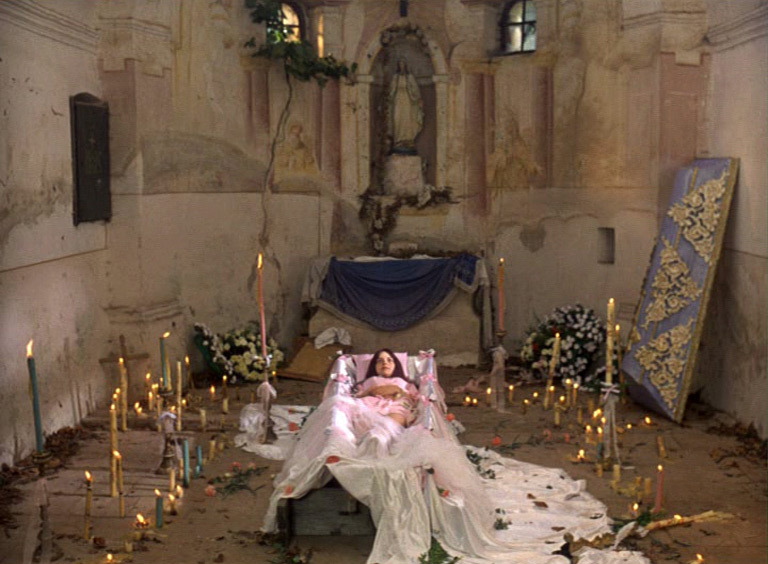 As benefits the film’s genesis, this scene draws heavily from Jiří Mahen’s 1910 stage play in both the staging and the perspective. Jánošík had four premiers in 1921 and 1922. Following shooting, a copy of the film was unofficially screened for the crew’s family and friends in the town of Vrútky, Slovakia (Votruba 2015). Following this, the first official print of the film was screened on November 25, 1921 in Prague, followed a month later by the film’s American premier in Cicero, Illinois— another center of expatriate life for Slovaks in America. The Slovak premier did not occur until January 3rd, 1922, when the film was officially screened in the town of Žilina, near the western border of Slovakia and the Czech Lands, and close to Jánošík’s birthplace, the village of Terchová. Although the film itself was a modest commercial success in Czechoslovakia and America, financial mismanagement doomed Tatrafilm, which closed shortly after. Jánošík quickly faded from the cultural landscape, and the film itself was lost until a surviving copy of it was found in the 1970s. Although lost in the chaos of the early years of the First Czechoslovak Republic, Jánošík manifests many of the essential hallmarks of what would later be known as the Slovak aesthetic. The camerawork, while slightly amateurish and primitive, strives primarily to highlight the beauty of the Slovak countryside. The film itself is told in a framing device— a group of hikers approach an elderly shepherd who, upon noting the resemblance of one hiker to the legendary bandit, retells the myth as if he were speaking to an anthropologist or ethnographer. Furthermore, the film openly grapples with the notion of Slovak identity and the existence of a free Slovak people— two common tropes which will appear prominently in the Slovak New Wave. Given the turbulent atmosphere that surrounded Jánošík, it may be little wonder to some to note that further attempts to make Slovak films were halting and few. Two other live action feature films were made, Strídža spod hája / The Witch Beneath the Grove (dir. Ján Moncoľ, 1922) and Pajácov osud / The Jester’s Fate (dir. Otto Kováč, 1924), but neither were successful. Both of these films are presumed to be lost and very few records of their reception survive. In many regards, Slovakia was a cinematic dead zone from 1924 until 1934. Not only did Tatrafilm implode, but Slovak directors and producers all but vanished from the cinematic landscape. Much like in the pre-Jánošík years, Slovakia was reduced to being a setting for films, not a producer of them. Fortunately for Slovak audiences, several Czech directors took an interest in Slovakia and Slovak themes, guaranteeing at least some continuation of cinema in the area. Two of the most important directors of these films were Martin Frič, a veteran Czech director from Prague, and Karel Plicka, a well-known ethnomusicologist, photographer, and Slovakophile. Although he grew up in the Bohemian town of Česká Třebová and the Austrian capital, Vienna, Karel Plicka’s heart always remained with Slovakia. Not content to merely be an ethnomusicologist and folklorist documenting obscure folk melodies in Slovakia’s highlands, Plicka devoted considerable time and energy to photographing rural Slovak life as well as learning the craft of documentary filmmaking (with generous support from the Slovak cultural organization, Matica slovenská). Plicka began making short documentary films about various facets of Slovak life in the 1920s. 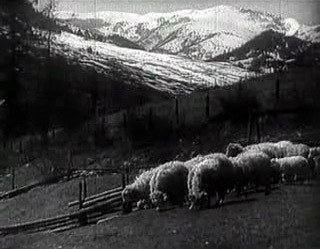 His 1928 film Za slovenským ludom / Tracing the Slovak People was a wide ranging document of architecture styles, folk costume, local customs, dances, and other aspects of neighboring Slovak culture that were exotic to Czech audiences and the following year, Plicka’s second documentary Po horách, po dolách / Through the Mountains, Through the Valleys opened to great domestic and international fanfare. Plicka’s collections of ethnographic photography were widely sold and distributed, further reinforcing the cultural identification of Slovakia with traditional folk costume and rural life. 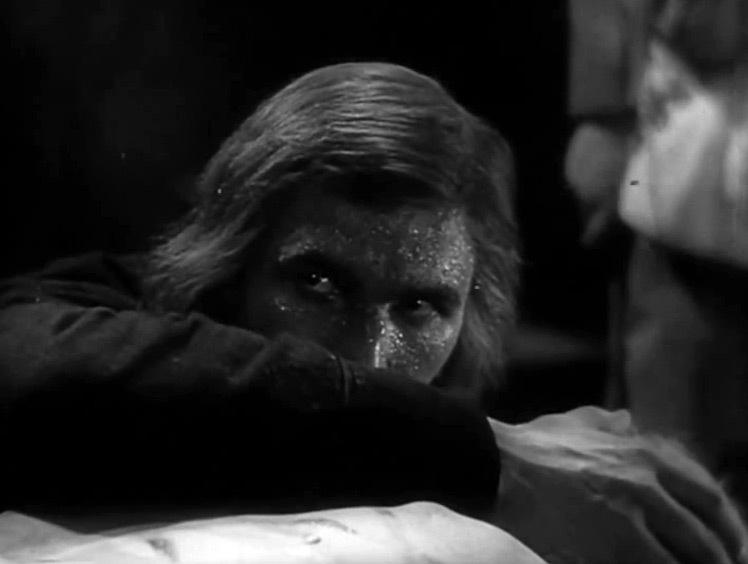 In 1933, due to the critical acclaim he received at international film festivals and in the press, Plicka was granted even more financial support from both Matica slovenská and the Czechoslovak government to create his only feature-length film, cinematic paean to Slovakia, Zem spieva / The Earth Sings. A completely unique take on the urban centric city symphony genre, The Earth Sings is a cinematic tone-poem of Slovakia, as the viewer journeys outwards from modern Bratislava to the “heart” of the Slovak countryside, where old remnants of the traditional way of life still remain. Here, the urban spectator is allowed to catch a glimpse of the raw natural power found in the misty mountains— storms bend and break trees, rivers roar and crash down, and the camera itself sometimes trembles. However, unlike the Slovak adults and children featured in the film, the observer is not at home in this particular world, underscoring the exotic and primal nature of Plicka’s Slovakia. 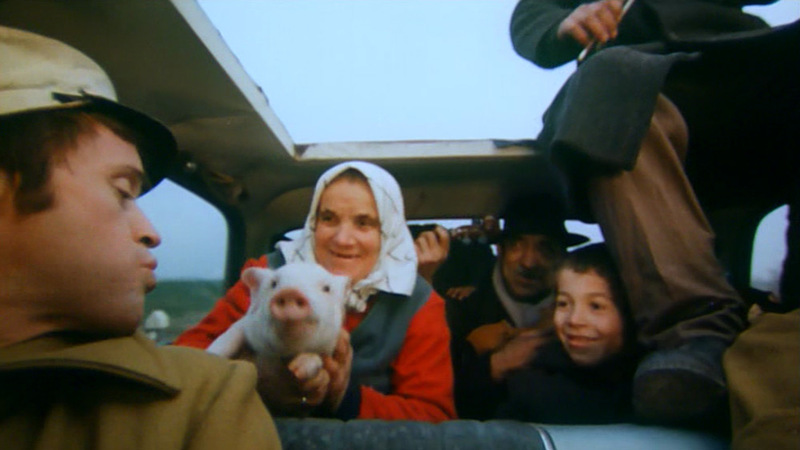 Although visually striking and lyrical, Plicka’s signature mixture of ethnographic scenes and nature shots was familiar to Slovak audiences and consumers who saw themselves reflected in the film. Czechs, on the other hand, enjoyed the exotic visuality of a still-alien portion of their own young country. Unlike the 1921 version, Frič’s retelling of Jánošík was an unqualified success among both Czech and Slovak audiences, who thrilled at watching Bielik’s exploits on the silver screen. Frič brought in Slovak screenwriters to give the dialogue additional veracity and memorable quotes, while Plicka was called in for consulting on folk costume, music, and other ethnographic aspects. The success of Jánošík (fig. 3-4) encouraged other Czech directors to take on similar Slovak projects, such as a biopic on the Slovak statesman/scientist/soldier Milan Rastislav Štefánik (dir. Jan Sviták, 1935). Fig. 4: … at the hands of the Count Sandor (fig. 4). These shots mirror the Surrealist and Poetists experiments of photographers such as Jaroslav Rössler. Frič’s version of Jánošík expands on the aesthetic that began in the 1921 version, and shows significant influence from Plicka as well in the treatment of the Slovak countryside. While the Siakel brothers framed their film within an excursion into Slovakia’s nearly-forgotten past, Frič goes even further and transforms the Tatras into a synecdoche of modern-day Slovakia. In this telling, Jánošík himself is transformed from a historical legend to the living embodiment of Slovakia itself. 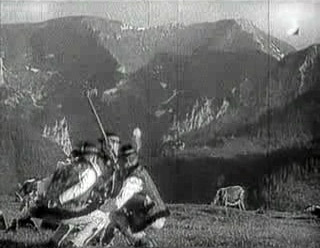 Perhaps the most famous scene where Jánošík shares the role of Slovak identifier with the Tatras occurs in the bandit’s death scene, which is dealt with explicitly in Frič’s version as opposed to quick fade to black featured in 1921 film. In Frič’s version, after being convicted of banditry, Jánošík is marched to the gallows and given a final chance at saving his life by turning his back on his ethnic identity and joining the Hungarian Army. While Jánošík looks longingly on the Tatra mountains he hears a musician strike up a melody on the dulcimer. Moved, Juraj summons all his strength and breaks the chains immobilizing his feet, eager to dance one final celebratory dance. Then, once finished, Jánošík spurns the mercies of his Hungarian captors, and, in defiance, flings himself willingly on the hook crying “As you have baked me, thus you shall eat me!” much to the awe and horror of the crowd. In his death throes, the bandit turns his eyes towards the mountain, and he dies surrounded by a montage of images from the Tatras, focusing on the same icy peaks and mist-wreathed summits that captivated Plicka two years previously. 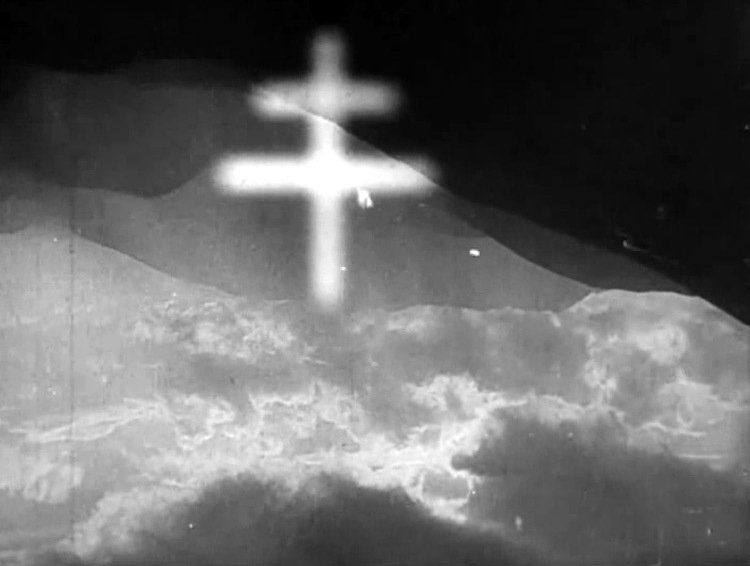 Finally, the ghostly image of the patriarchal cross (a long-standing part of Slovakia’s heraldic vocabulary) appears over the mountains themselves, anointing and sanctifying them. Jánošík’s death not only honors the Tatras as the inspirations of Jánošík’s final act of defiance, it transforms the site into a mystical reliquary, wherein Jánošík’s blood on the stones becomes as mountain stream, and Jánošík’s broken body on the hook is subsumed into the Tatras themselves (fig. 5-6). Fig. 5: Jánošík (dir. Martin Frič, 1935). 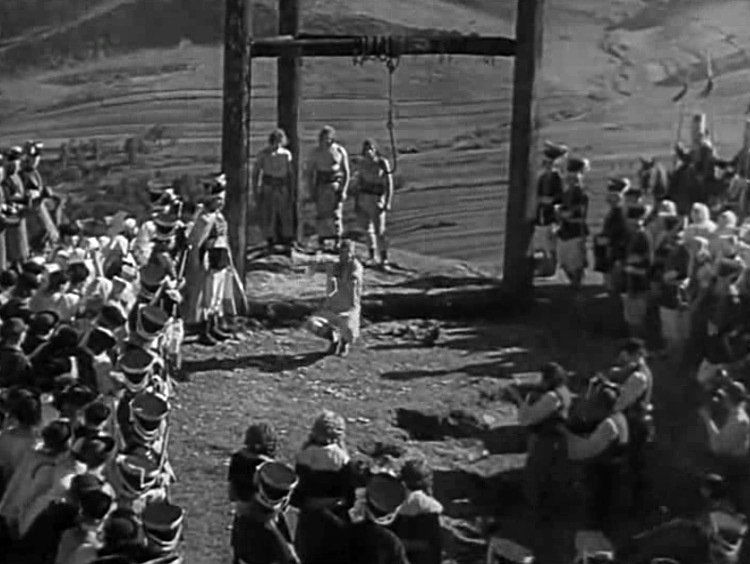 The famous death sequence features Jánošík ripping his shackles off before impaling himself on the hook. Fig. 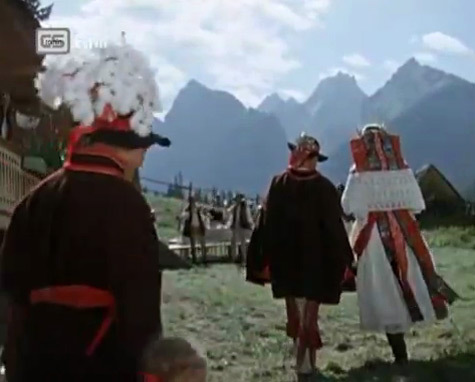 6: The montage that follows as Jánošík hangs dying is of the Tatra mountains, culminating with the double-barred cross found in the Slovak coat of arms. Fig. 7: The Earth Sings (dir. Karel Plicka, 1934). The Slovak mountains are as much a part of the Slovak aesthetic as any cinematic technique. Much of Plicka’s film deals with Slovaks living in these mountains, ignoring the populations that live on flat land in the South, whose culture was not always as “Slovak” as Plicka would have liked. Fig. 8: The Earth Sings (dir. Karel Plicka, 1934). Dancing, singing, and folk costume were integral parts to the early Slovak cinematic aesthetic, which later Slovak directors often felt was a burden that they felt imposed upon them by non-Slovak audiences and government officials. Following World War II, both Czech and Slovak film were nationalized and put under centralized control. On the one hand, this step meant that Slovaks finally had the financial and institutional backing to make films on par with other national cinemas, while the establishment of the national film school, FAMU (Filmová a televizní fakulta Akademie múzických umění v Praze) in Prague meant that Slovak film students would be given an education equal to that of their Czech colleagues. On the other hand, this ensured that, for the first several years of production at least, Slovak films would be dictated along the official guidelines as set forth in Prague— especially after the 1948 Communist putsch. Even though they were the largest minority in Czechoslovakia, Slovaks did not receive any sort of preference in terms of film resources. Slovak films still lagged significantly behind Czech productions in feature films, averaging only a handful a year. The most prominent director of this period was the former star of Frič’s Jánošík, Paľo Bielik, who retreated behind the camera during World War II, and who spent much of the war making apolitical documentaries despite the best efforts of the Fascist regime. In fact, up until 1953, Bielik was the only professional Slovak director active in Czechoslovakia, which also helps explain the era’s paltry output (Mácek & Paštéková 1997: 167). Of these feature films made by Bielik, or the handful of Czech and Slovak directors making Slovak-language films, a significant majority of them either dealt with romanticized retellings of Slovak partizan resistance during World War II, such as Kapitán Dabač / Captain Dabač, Varuj! / Beware! (dir. 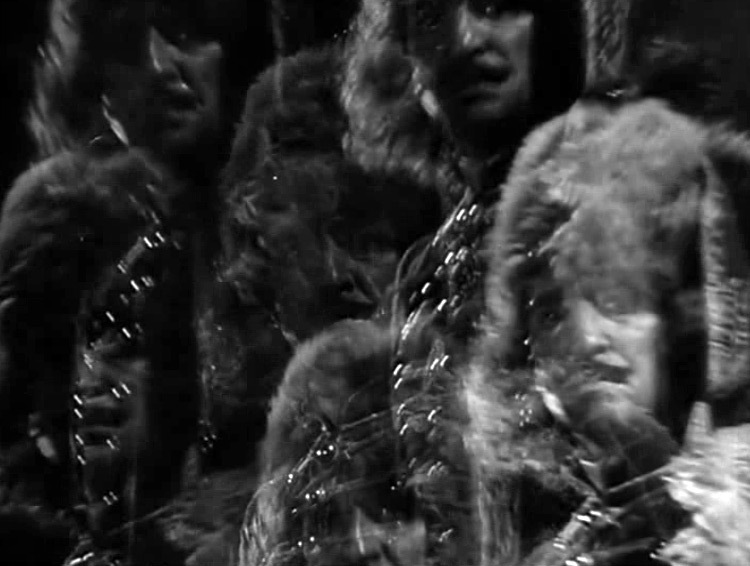 Paľo Bielik, 1959, 1947), or folkloric films with heavy emphasis on musical numbers and intricate choreography, such as Rodná zem / Native Land (dir. Joseph Mach, 1954) (fig. 9-10). Fig. 9: Native Land (dir. Josef Mach, 1954). Martin Ťapák (here in the role of Martin) made a name for himself as a director of comedic Slovak folk-operas in the 1970s, but before then, he was a dancer and singer in various Socialist Realist folk productions, like Native Land. Note the contrast between modern Bratislava and Martin’s traditional garments. Fig. 10: Native Land (dir. Josef Mach, 1954). Although Native Land acknowledges that modern areas exist in Slovakia, the film’s climax involves the hero and his bride returning back to their rural Slovak roots. Documentary films about Slovakia and Slovak concerns fared better, in terms of both material support and creative freedom. In addition to being a fairly common genre in Czechoslovak film, documentary filmmaking was often the place where talented young directors were sent to hone their skills in the days of Socialist Realist filmmaking. The brand of cinema vérité espoused by the Socialist cultural authorities mingled well with the historically Slovak drive for documenting their own culture, and, as a result, documentary film flourished. 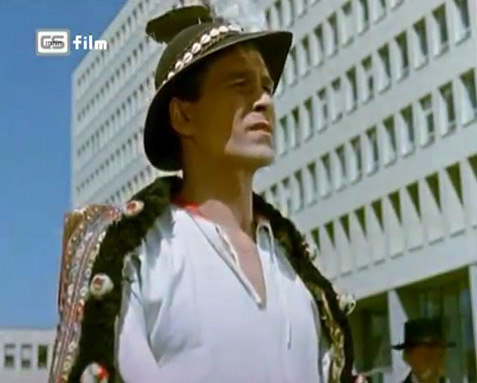 Films such as the aforementioned Native Land (dir. Mach, 1954) explicitly set out to co-opt and repurpose the nationalistic usage of Slovak folk imagery and music for the good of creating a unified, Socialist Czechoslovakia. Mach’s film, for example, features a range of Slovak folk musicians from disparate parts of Slovakia unifying in a grand, Socialist, folk ensemble, where Eastern and Western Slovaks, Roma and whites, and men and women are harmoniously brought together for the good of their homeland. While perplexing to Czech audiences, Slovak audiences embraced these familiar cinematic tropes with gusto, hungry for cultural recognition in a familiar form. By the 1960s, conditions finally improved enough for Slovak cinema to evolve artistically beyond the folk costume-heavy spectacles which so incensed Jaroslav Boček. The gradually loosening of political control in the nationalized film industry, coupled with a generation of film school graduates aware of outside cinema movements and who had broader range of stylistic and formalistic experimentation to draw on, led to increased cinematic risk-taking. After nearly a decade of formulaic musicals and folkloric documentaries, Slovak directors were able to produces films which were stylistically and formally innovative, yet also wrestled with the legacy of their own Slovak aesthetic, as defined through Czech exoticization of their homeland and the ethnographic legacy of early cinema. Directors such as Štefan Uher, Elo Havetta, Dušan Hanák, Juraj Jakubisko, and Martin Slivka wrestled with the weight of ethnic pride and the desire to create new forms of expression which were tied not to the past, but linked with the contemporary political and social situation in 1960s Czechoslovakia (for more on Uher, see Hudac 2014) (fig. 11). Fig. 11: The Sun in a Net (dir. Štefan Uher, 1962). Uher’s film combines teenage rebellion with the Slovak countryside, paving the way for the films of the New Wave. 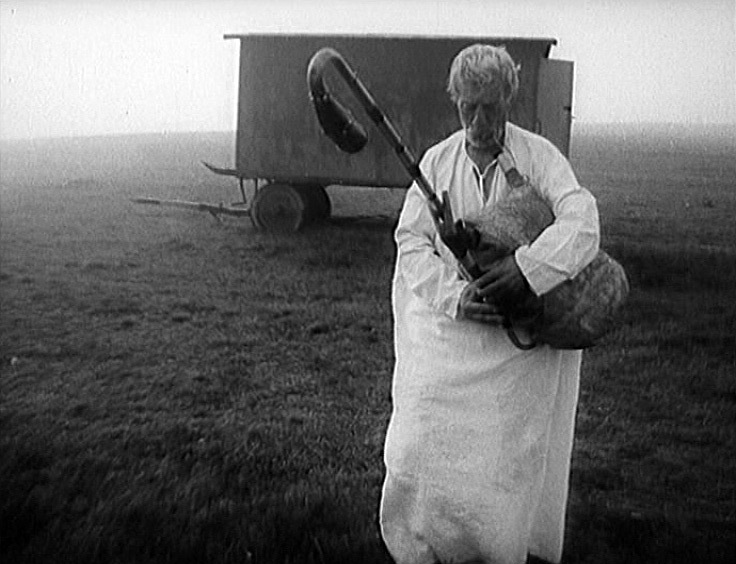 Regardless of genre, these directors began to combine the now-familiar rural and folkloric elements of Slovak visual culture with the more experimental aspects of the Czech and Slovak avant-garde traditions— such as Surrealism, Cubo-futurism, which lead to the creation of the Slovak aesthetic mentioned by Liehm. This morning, you said something about my poetics being different, being Slovak. I don’t really feel any diametrical difference, at least between Bratislava and Prague. I once said that I don’t feel like a Slovak director; at most I might feel like an Eastern Slovak director. People there are extremely temperamental.”(Liehm 2001: 370). 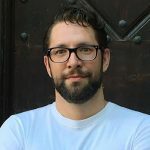 Martin Slivka, also a FAMU alumnus and the premier documentary filmmaker of his day, drew much of his inspiration from Plicka’s work and the Cubo-futurist photographic tradition. 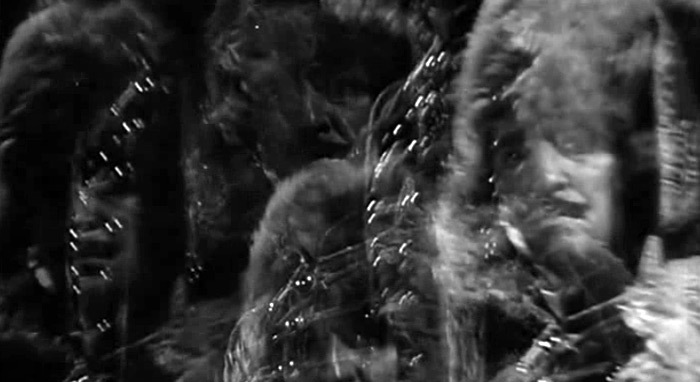 This is perhaps most famously seen in his 1963 film Voda a práca / Water and Work, which took a documentary ostensibly about traditional Slovak waterwheels and transformed it into an abstract Cubo-ethnographic survey of how Slovaks interact with the natural world in the course of manufacturing these “traditional” (yet still very ordinary) handcrafts powered by Slovakia’s essence. Even Hanák, the consummate urbanite drew inspiration not just from folkloric traditions in his 1972 documentary Obrazy starého sveta / Pictures of the Old World, a collaboration with re-known Slovak ethnographic photographer Martin Martinček, he inverted them to act as an ironic commentary on a Slovakia that still existed on the fringes of modernity into the 1970s, showing a Slovakia untouched by the promised progress of the Czechoslovak state (fig. 12-13). Hanák further refined this approach with the lyrical meditation on rural Slovak race relations with Ružové sny / Rosy Dreams, a magical realist story of the relationship between a young Slovak postman and his Roma girlfriend, filled with folk songs and dances but coupled with razor sharp observations on the problems of traditional ways of life. Fig. 12: Pictures of the Old World (dir. Dušan Hanák, 1972). Shepherds are still a common sight in the Slovak highlands, and Hanák deromanticizes this trope in this particular scene with a lonely alcoholic shepherd. Fig. 13: Slovakia remained highly Catholic and deeply religions in spite the official Socialist stance on religion up through the end of the totalitarian government in 1989, elements of which find their way into New Wave films as a means of protest. Following the 1968 invasion, however, these pioneering Slovak filmmakers were re-assigned and their work was restricted (and in many cases banned). Hanák and Jakubisko both found themselves making documentary films, Slivka was reassigned to projects outside of Czechoslovakia in Bulgaria and East Germany, and Havetta’s banishment from the film world triggered a deep depression that would lead to his early death (fig. 14-15). Fig. 14: Celebration in the Botanical Garden (dir. Elo Havetta, 1969). Havetta combined Slovakia’s indigenous Catholicism with mystic and magical elements. Fig. 15: Celebration in the Botanical Garden (dir. Elo Havetta, 1969). However, although the directors themselves were deemed politically problematic, the emotive, folkloric-surrealistic style they pioneered survived and was eventually subsumed into the state’s official aesthetic program (fig. 16-17). Fig. 16: Birds, Orphans, and Fools (Juraj Jakubisko, 1969). 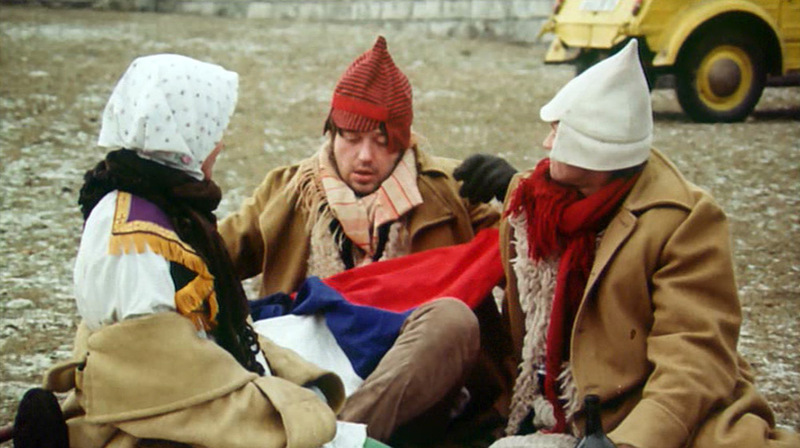 Jakubisko’s own abivalence towards his ethnic identity is a running theme throughout the film. Here the film’s protagonists sit in front of the tomb of Milan Štefánik, a general and national symbol in the First Republic, and pledge their allegience to each other and madness. Fig. 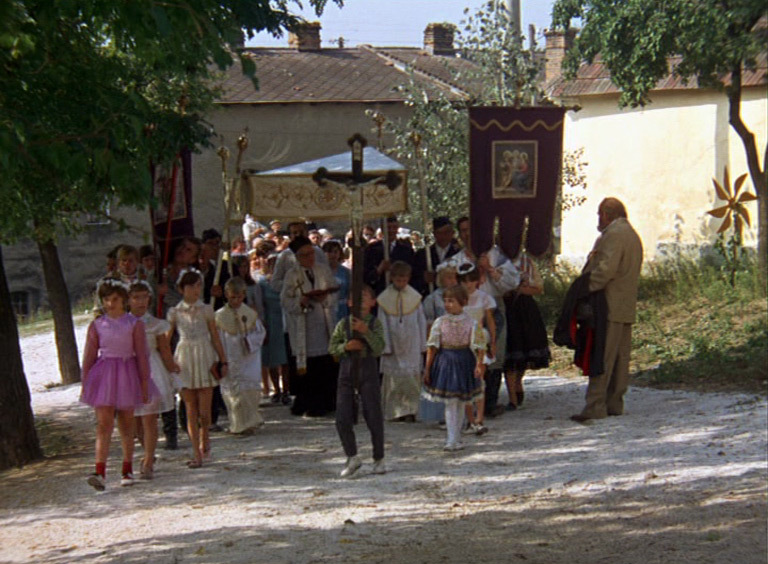 17: Birds, Orphans, and Fools (Juraj Jakubisko, 1969). The climax of Birds, Orphans, and Fools takes place during a road trip to the Slovak countryside, where Jakubisko mocks the traditional images of Slovak identity. Perhaps due to its unusual genesis, Slovak film remains a tradition defined as much by its aesthetics as its geographical provenance. Instead of forsaking the folkloric traditions that had been its foundation in the years up until World War II, Slovak cinema drew more and more heavily on these traditional elements, even as Slovak filmmakers began to experiment with cinema’s formal and narrational aspects to an extraordinary degree. Furthermore, as questions regarding Slovakia’s status in Czechoslovakia grew more pointed and ethnic strife between Czechs and Slovaks became more and more heated in the 1960s, Slovak directors often also drew on the work of Czechs who had been so formative in the development of the medium in Slovakia, leading to the weird aesthetic guláš of Slovak sensibilities and Czech (and Czechoslovak) avant-garde experimentation, resulting in the so-called Slovak Aesthetic. The influence of this style of filmmaking even continues to resonate with Slovaks into the current, post-Totalitarian era, as young Slovak filmmakers alternately embrace the mix of folkloric romanticism (often called the “Hanging Gardens” school of filmmaking in Slovak scholarship [note 4]) which was so often the hallmark of mid-20th century Slovak film, or reject it in favor of hard-eyed realism which aligns itself with the tradition of Slovak ethnography and documentary photography. Boček, Jaroslav (1966? ): “Twenty Years of Czechoslovak Film”. Collected in Modern Czechoslovak Film 1945/1965. Praha: Artia, date unknown, pagination missing. Bugge, Peter (2004): Collected in: Austrian History Yearbook. No. 35. Hanáková, Petra (2009): Paľo Bielik a slovenská kinomatgrafická kultura. Bratislava: Slovenský filmový ústav. Hasan, Petr. (2016): “Neslušný a nevkusný film nemůže býti krásným”.Katolická akce, struktury katolického tábora a jejich působnost na poli kinematografie v českém prostředí první poloviny 20. století” in Iluminace vol. 1. Liehm, Antonín J. (2016): Closely Watched Films : The Czechoslovak Experience. New York: Routledge. Mácek, Vaclav and Paštéková, Jelena (1997): Dejiny slovenskej kinematografie. Bratislava: Osveta. Votruba, Martin (2005): “Historical and National Background of Slovak Filmmaking”. Collected in: KINO KULTURA 3. Online, retrieved Nov. 10, 2016. Votruba, Martin (2006): “Hang Him High: The Elevation of Jánošík to an Ethnic Icon”. Slavic Review, vol. 65, #1. Votruba, Martin (2015): “Jánošík.” Online, retrieved 22.5. Zecker, Robert M. (2002): “Not Communists Exactly, but Sort of like Non-believers”: The Hidden Radical Transcript of Slovak Immigrants in Philadelphia, 1890-1954. Collected in: The Oral History Review, Vol. 29, No. 1 (Winter-Spring 2002) p. 2-3. All translations from Czech and Slovak are the author’s own. Note 1: Czech cinema follows the typical model of national cinema development fairly closely. Czech early adopters and experimenters give rise to domestic feature film production by 1910, and by the 1920s, the Czechs have a thriving cinema culture that includes not just the import of well-known foreign films, but a growing domestic production of all types of films, ranging from Cubist/Poetist experiments to traditional genre films. Note 2: Slovaks, even more so than many ethnic groups in Central Europe, frequently traveled abroad for work or due to Hungarian political repression of Slovak nationalism, and back to Slovakia in times of political peace and economic prosperity. This migration was widespread enough that it became a well-known trope in literature from the First Czechoslovak Republic, such as in Karel Čapek’s well-known novel (and its subsequent film adaptation), Hordubal. Note 3: One of the problems with dealing with Slovak culture, in so much as such a construct exists, is a rather persistent streak of linguistic and cultural regionalism that often runs against the grain of national sentiment. As Robert M. Zecker notes, Slovak immigrant communities in America “identified more readily with regions of origin than any national identity as Slovaks”. See: Zecker, Robert M. (2002): “Not Communists Exactly, but Sort of like Non-believers” : The Hidden Radical Transcript of Slovak Immigrants in Philadelphia, 1890-1954. Collected in: The Oral History Review, Vol. 29, No. 1 (Winter-Spring 2002) p. 2-3. Note 4: I am borrowing this term from the work of Katarína Mišíková and Jana Dudková, who use it to describe films from directors such as Martin Šulík, whose work combines magical realist elements with ordinary, urban situations.